Imogene "Jean" Jewell Mullins, 84 of McConnell, passed away Wednesday, April 3, 2019 at Logan Regional Medical Center peacefully surrounded by her beloved family and in the presence of the Lord. Born May 22, 1934 in Stonebranch, WV, she was the daughter of the late Joe and Edna Bryant Brewster. 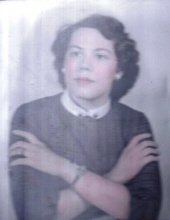 Jean was also preceded in death by her husband of 64 years Everett Mullins, as well as her siblings Cornelius Brewster, Randolph Brewster, Tom Brewster, John Brewster, Ruth Collia, son in law Mark Summers, and daughter in law Bonnie Mullins. Jean was a dedicated wife, mother, grandmother, great grandmother. A woman of strong Christian faith and an absolute lovely fashionable lady with love in her heart and the will to conquer anything. Jean was a member of the McConnell Tabernacle for over 50 years, where she sang in the choir. She was employed at McCormicks for 25 years. She enjoyed spending time with family, shopping on QVC, and making sure we all knew who the families boss was. Those left to cherish her memory include her four children Anna Ruth Summers of Logan, Rhonda Sue (Bill) Craddock of Man, Donavon Clyde Mullins of Earling and Michael Todd Mullins of McConnell, her grandchildren Christopher Mullins, Carla Jean (Steve) Lukacs, Donavon (Jaime) Mullins, Bill (Trina) Craddock, Chad (Ashley) Mullins, and Beth Barker, her great grandchildren Steven (Natalia) Craddock, Tessa Mullins, Kaitlyn Sue (Tracy) Jones, J.D. Mullins, Zackary Craddock, Julia Mullins, Ashley Craddock, Christopher Mullins, Elijah Guest, Caleb Potlow, Chase Mullins and Hunter Mullins, Jean is also survived by her great great grandchild "Baby C", coming this October of 2019. Funeral services will be held on Saturday, April 6, 2019 at 12:00 PM at Honaker Funeral Home of Logan, with Rev. Rodney Robinette officiating. Burial will follow in Forest Lawn Cemetery at Pecks Mill, WV. Grandsons and great grandsons will serve as pallbearers. Friends may call on the family from 11:00 - 12:00 PM at the funeral home on Saturday. To send flowers or a remembrance gift to the family of Imogene J. Mullins, please visit our Tribute Store. "Email Address" would like to share the life celebration of Imogene J. Mullins. Click on the "link" to go to share a favorite memory or leave a condolence message for the family.